Ageing is a natural process, which presents a unique challenge for all sections of the society. The demographic profile of the Caribbean is changing and so we are seeing people living longer. We are also seeing a larger representation of older persons in our society. Although the exact definition of elderly age group is controversial, it is defined as persons with a chronological age of 65 years and above. With gradual improvement in health-care delivery services, life expectancy has increased and thus the percentage of the elderly population. It has been estimated that the number of people aged 60 and over will increase to 1.2 billion in 2025, and subsequently to two billion in 2050. Further, by the year 2025, almost 75 percent of this elderly population will be living in developing nations, which already have an overburdened health-care delivery system. These demographic transitions essentially require shifting the global focus to cater to the preventive health-care and medical needs of the elderly population. diabetes, hypertension, arthritis, eye problems and other physical disabilities are amongst the leading health problems faced by the elderly population. The health needs and health related problems of elderly people cannot be viewed in isolation. A wide gamut of determinants, such as social concerns (viz. children moving out of their parents’ home in search of occupation, leaving them isolated without any physical support in daily activities); maltreatment towards elderly; poor knowledge and awareness about the risk factors; food and nutritional requirements; psycho-emotional concerns (viz. isolation, mental stress, difficulty in keeping themselves occupied); financial constraints (viz. definite reduction in income upon retirement, to the extent that it may interfere with basic needs of life as adequate nutrition, clothing and shelter); health-care system factors (viz. most countries lack effective health insurance system for elderly coupled with accessibility concerns and inadequacies in the government health-care system); and physical correlates; determine the medical problems and thus cast a significant impact on the quality-of-life of the elderly. One thing is certain, most of us will fall in this category. We will expect that our love ones and society take care of us. Therefore, it is incumbent upon us to take care of the elderly in society. Prevention and control of health problems of elderly necessitates a multifaceted approach incorporating active collaboration of health, social welfare, rural/urban development and legal sectors. A community based geriatric health-care program should start with the development of a comprehensive policy so as to include not only medical aspects, but other determinants as well. Strong political commitment and social action are imperative for the effective implementation of customized policy at the grass root level. Remember these are the persons who laid the foundation for us. 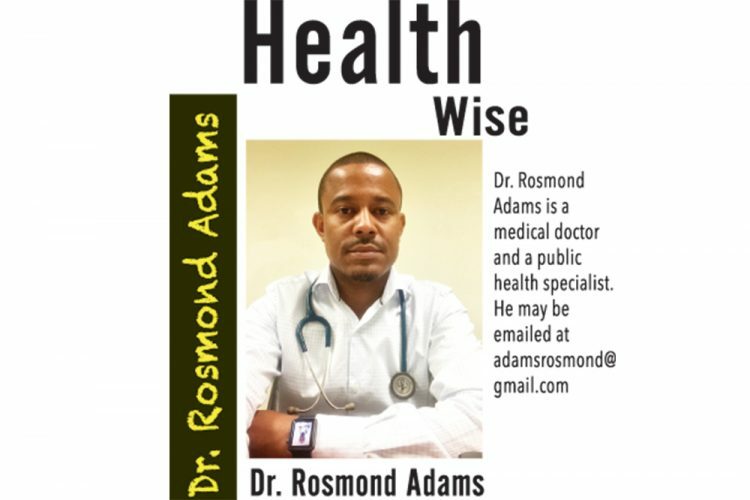 Dr. Rosmond Adams, MD; MSc (Public Health); M.S (Bioethics) is a medical doctor and a public health specialist with training in bioethics and ethical issues in medicine, the life sciences and research. He is a lecturer of medical ethics and Research Methods. He is the Head of Health Information, Communicable Disease and Emergency Response at the Caribbean Public Health Agency (CARPHA). He is also a member of the World Health Organization Global Coordination Mechanism on the Prevention and Control of NCDs.